Only one game was played in the Southern League South and West this evening. EVO-STIK League Southern Barton Rovers are making international headlines after splashing out on a big signing on transfer deadline day! Sadly for Rovers manager Jimmy Gray, he won't be worrying about the club's latest arrival being cup tied for Tuesday night's quarter-final clash with St Ives Town at Sharpenhoe Road. 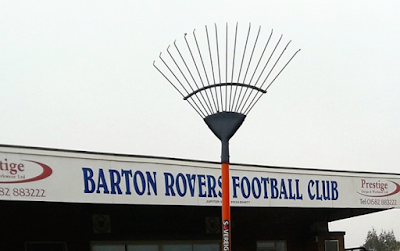 Instead of a new player, the spoof-loving media team at the EVO-STIK League Southern Division One Central club took to Twitter to post a picture a new rake they'd bought in a local DIY store for their ground staff! 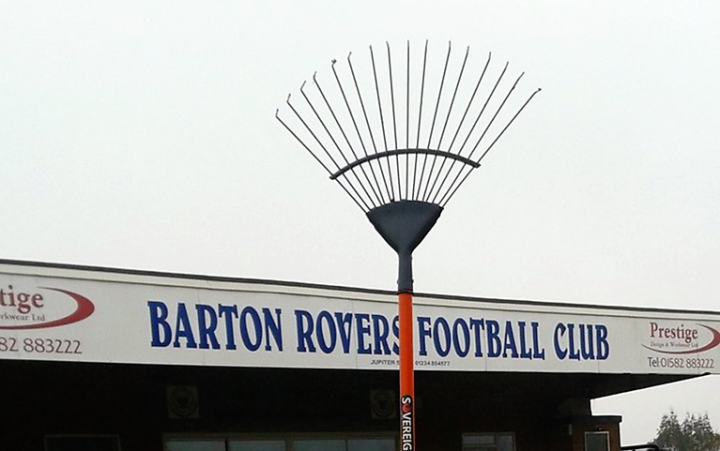 The tweet from @bartonroversfc - "Deadline day signing news, not to be out done by the 'Big Boys' we have spent £6.99 at Homebase on a new rake #NonLeague its how we roll" - went viral within hours with clubs around the world spending millions on new players and was even picked up by the giant Fox Sports network in the United States. On Twitter the club's jokers were inundated with responses from tickled fans, one posting: "I must say it is an impressive rake. Tall, sturdy, and at under seven pounds, I’d say the price is right. A good deal if you ask me." Another wit wasn't so impressed with the club's latest acquisition, responding: "Panic buy. It won't pan out." For today's archive article BN looks back to 31st January 2006 and a home game against Cambridge United. Interesting to note in the report that Rob Purdie is praised for his performance in mid-field. Prize Bull Lottery draw No. 139 took place on Monday night. Should you have the winning combination, please contact prizebull@hufctrust.co.uk to claim the jackpot. More details on the Prize Bull Lottery and entry forms are on the Prize Bull Lottery page. Prizes are on offer for matching one number or more and it’s easy to enter. 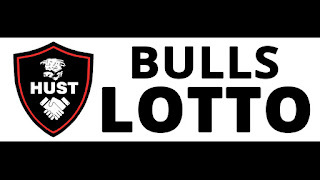 Simply click https://www.lottofc.co.uk/bulls/index.htm to get started and be in with a chance of winning Wednesday's jackpot. Beadle Provoked By Tiverton Physio? 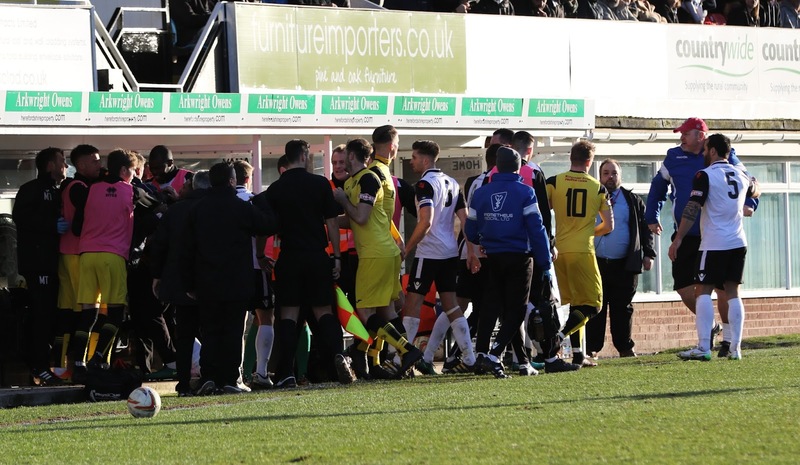 There was a stoppage lasting several minutes during the first half of Saturday's game against Tiverton Town at Edgar Street when the dug-outs appeared to come to blows. The incident happened just as Mike Symons was brought down. It took the shine off what turned out to be a good day for Hereford with three points from the game and other clubs dropping points. 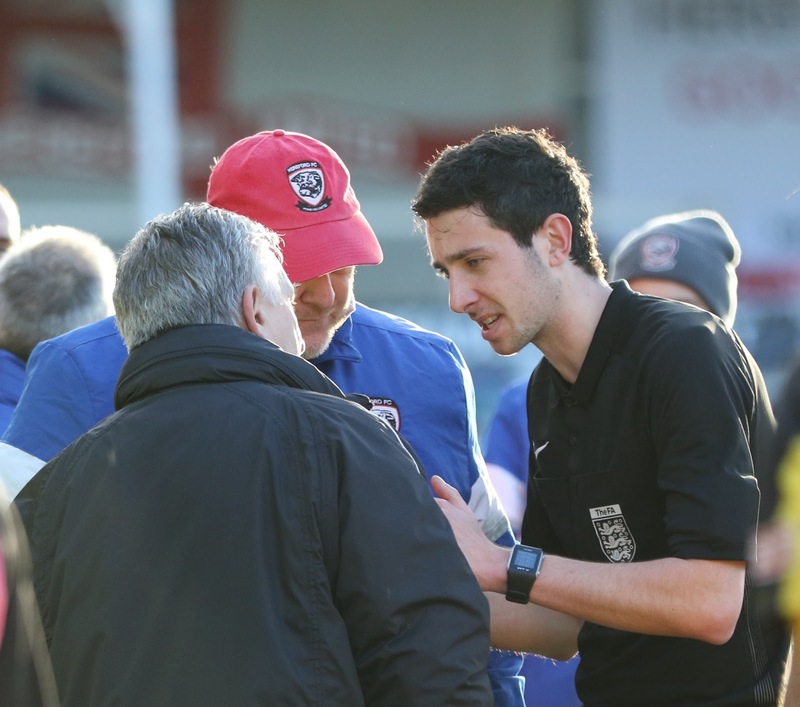 BN understands that the Tiverton Physio called Hereford manager Peter Beadle an offensive name. What provoked the physio isn't known. "I think something was said. I reacted a bit in the wrong manner and there was a little bit of handbag stuff." The Referee Had A Few Words With Both Managers. It's understood that a referee can not send a physio to the stands. He said: "I made a personal comment to Beadle following a challenge (BN: On Mike Symons). He understandably reacted as would I. Before the second half I apologised. "Peter is a gent and we spoke before the second half. We shook hands, I apologised for my conduct as did he and there was pint for him." On Saturday both the under 13's and under 16's progressed in the Junior Premier League Cup. The under 13's progressed into the quarter finals and the 16's into the semi finals. 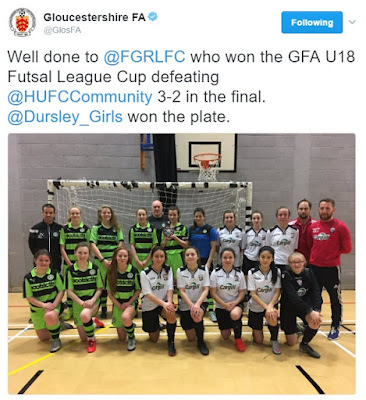 On Sunday Hereford U18's girls lost to Forest Green in the final of the Gloucestershire FA futsal tournament. The first goal came with the first shot of the game after 10 minutes, the lively Samuel Griffiths scoring the away sides first goal. That seemed to wake the home team up and the attacking players for SS UK (Ox) started to find their rhythm. Midway through the first half, a hand ball in the Hereford box allowed Kieran Day to even the score from the penalty spot, his first attempt was saved by Jamie Smith, however Day was on hand to score the rebound, 1-1. Moments after SS UK (Ox) equalised, Hereford broke quickly from a corner and Griffiths got his second of the game, after good work down the Hereford right wing, 1-2. SS UK (Ox) found themselves 1-2 down at half time. SS UK (Ox) were so desperate to get back into the game in the second half, that within 40 seconds of the restart, a fantastic cross from Day on the left found Ryan Jones, who headed the ball into the net and made the score 2-2, game on! Both teams played the second half were high intensity, quick passing and forward movements. 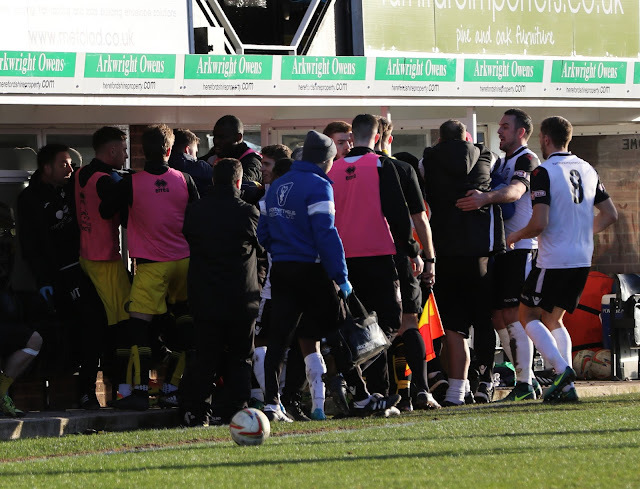 With 5 minutes to go, the game never looked like it was going to into extra time and Hereford made sure it didn't! Again, great work down the Hereford right, saw a cross make its way to Griffiths in the box, who completed his hat-trick to make the score 2-3. Overall, the game was played in the right manner and was a pleasure to watch. Hereford started brightly and should have scored twice early on but the Kidderminster GK was quickly off his line to smother both attempts. 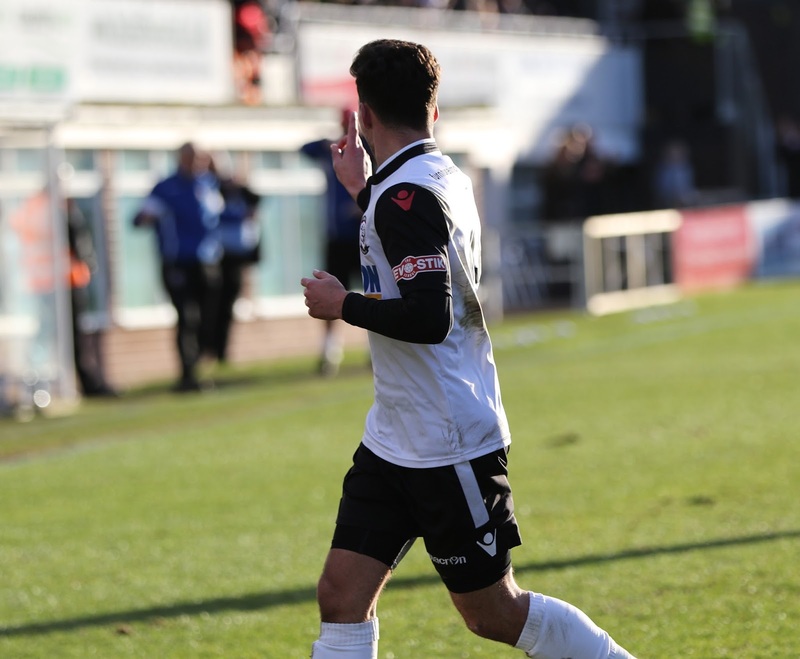 It took Kidderminster 15 mins to get into their stride but once Hereford allowed them to play it was clear why they were undefeated in the league. Herefords narrow system forced Kiddy to play in wide areas and despite doubling up to create plenty of 2v1s Hereford defended their final 3rd exceptionally well. 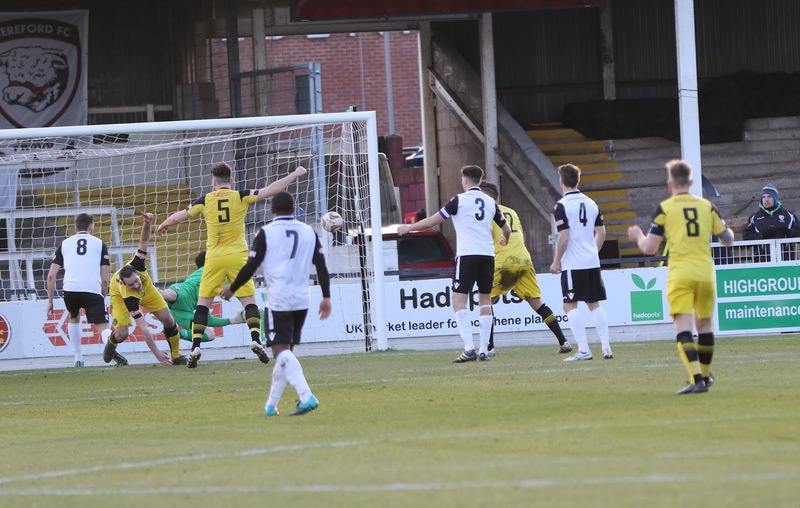 However Kidderminster broke the deadlock when a free kick was put into the box, an attempted clearance was sliced and the ball was eventually thumped home. From here on in the game turned into a typical cup tie. Kidderminster looking to press high and Hereford being streetwise and playing around or over. The equalising goal eventually came when Hereford striker was brought down when heading in on goal. The resulting free kick was dispatched directly into the bottom corner and it was into extra time. Hereford, with their tails up, went for the win. But the more expansive system allowed Kiddy more space and chances were created at both ends. Kiddy took the lead two more times but the determination and desire of the current cup holders was phenomenal, coming from 2-1 down and 3-2 down to take the game to penaltys. 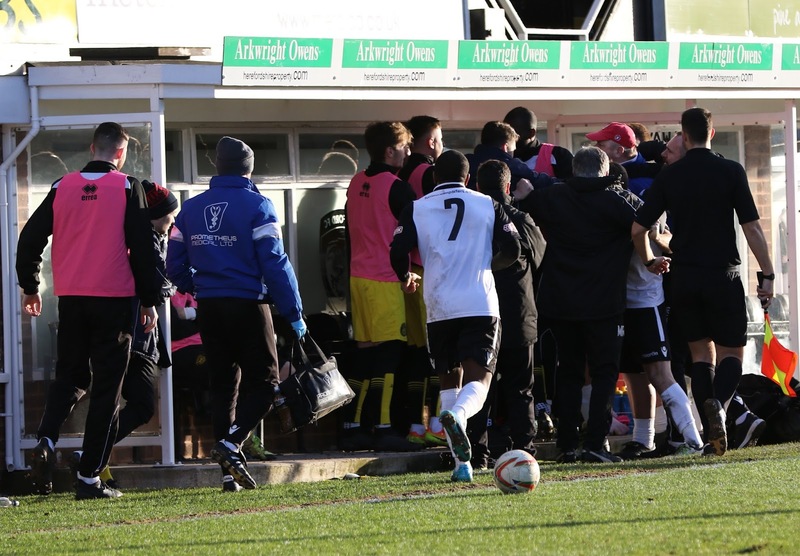 It was evident Hereford were more confident in this situation following the exploits of last season. The visitors missed their opening two spot kicks whilst the hosts were cool, calm and collected, tucking the first four away and progressing to the semi finals. Kidderminster played the better football but Hereford learnt a valuable lesson in game management today and will be better for it. The team spirit and 'never say die' attitude was Immense. HUST is to purchase a further £10,000 worth of shares in Hereford FC. This will take their investment in the club to £100,000. HUST have allocated a further £10,000 for share purchase and this will be handed over to the Club very shortly. This takes the total value of shares in HUST ownership to £100k or just under 35% of the target of £289k. The Trust has a five year target to reach its total and is currently well placed to achieve this as a further share purchase is planned very shortly. 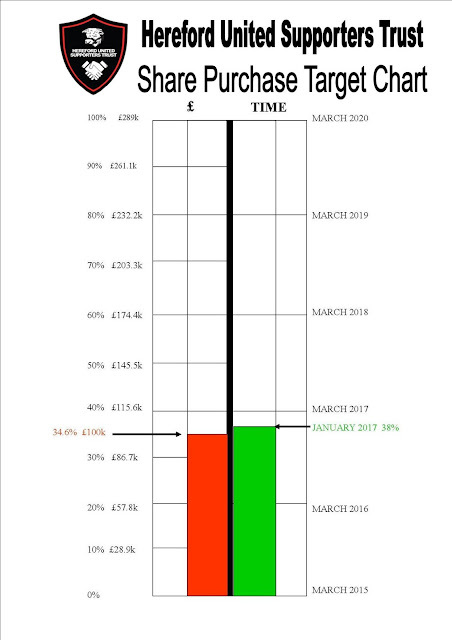 The enclosed chart shows that our share holding is keeping good pace with the time-scale, and we are excited at the prospect of further supporting our great Club. In order to boost its income, The Trust has added a range of activities to enhance its efforts. Running alongside the matchday 50/50 draw and the Prize Bull Lottery, a further "Bulls Lotto" has been launched which offers life-changing prizes. In the first week (three draws) HUST received £200 as its share of stake money, and a number of participants have reported small pay-outs. We eagerly await our first sizeable win. All the details may be found on the official Trust Website www.hufctrust.co.uk where you will find details of two other exciting new ventures, the Sports Quizzes and The Tommy Cooper show night. Follow the "fundraising" tab to "events" for all the details. Former Hereford United mid-fielder John Snape is to become care-taker manager of Worcester City following Carl Heeley's decision to quit after seven years in charge. Heeley gave a long interview to BBC Hereford and Worcester last night in which he spelt out his intentions. Later he met club chairman Anthony Hampson. John Snape joined Hereford United in May 1998. "Mr Turner wants to take the club back into the League and if I could help Hereford achieve that, it would be brilliant," he said at the time. As ever this review is written by Pitchero's Steve Whitney. 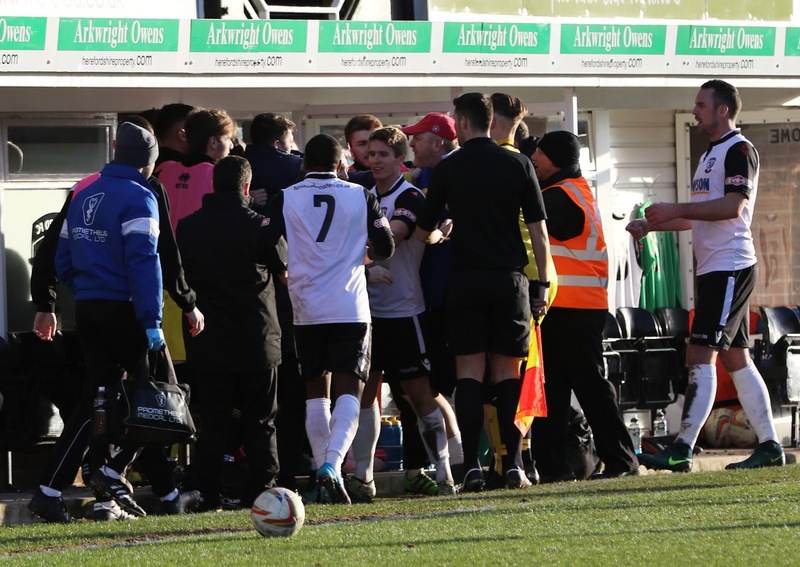 Hereford FC's march towards the EVO-STIK League Southern Division One South & West title continued on Saturday when they beat third-placed Tiverton Town 2-1 to move a whopping nineteen points clear at the top. 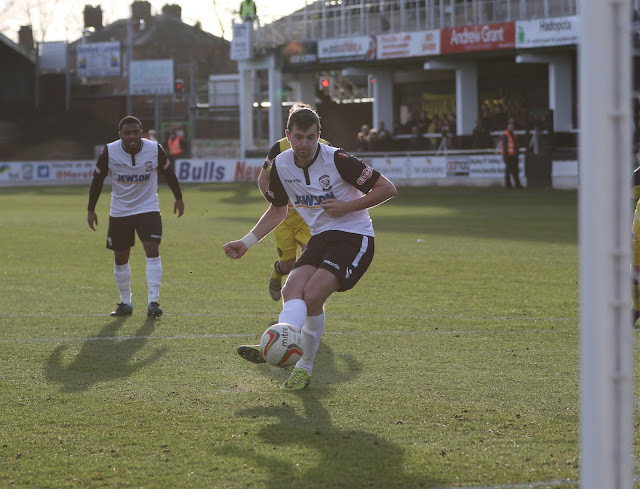 Another terrific crowd of 3,049 at Edgar Street saw top scorer John Mills open the Bulls` account from the penalty spot in the 12th minute. 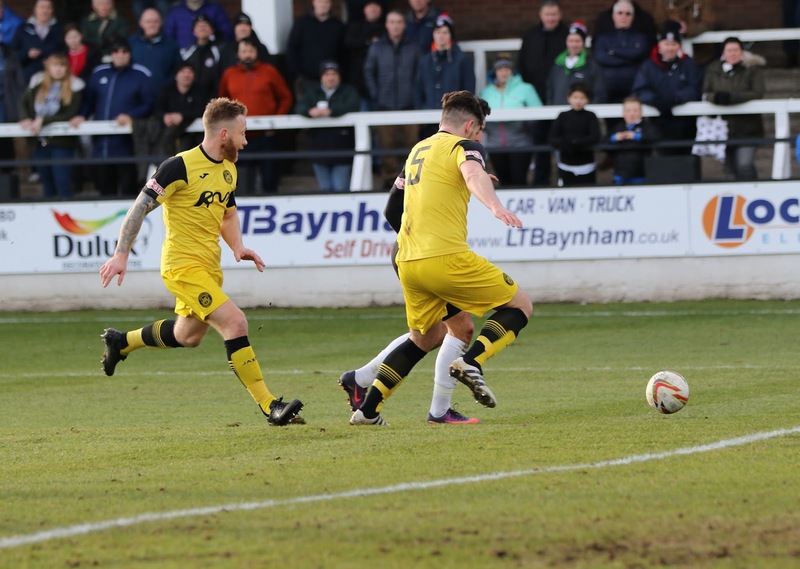 Pablo Haysham doubled their advantage in the 25th minute but Tivvy gave them a test and pulled one back through Tom Gardner eight minutes before the break. Second-placed Evesham dropped two home points to do the Bulls a favour when they were held to a 2-2 draw by lowly Paulton Rovers. Kailan Gould gave Rovers a 15th minute lead that Lorcan Sheehan and Lance Smith turned round before half-time. 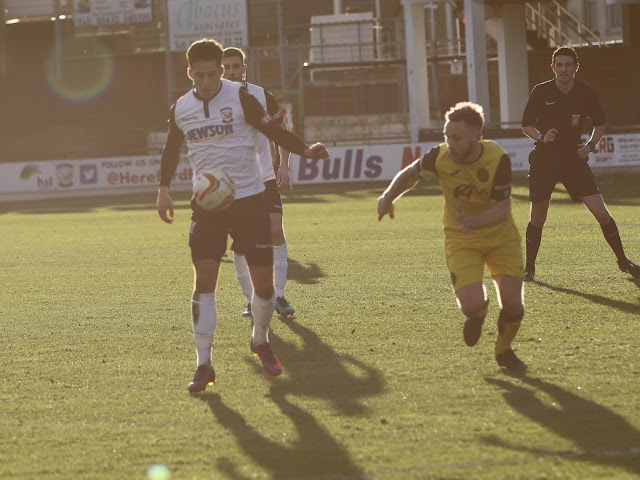 But Sol Wheatley grabbed a point for the visitors four minutes from time. Fourth-placed Swindon Supermarine were also held to a draw – 0-0 at Wordsworth Drive by seventh-placed Taunton Town. Salisbury FC are fifth after a 4-0 Raymond McEnhill Stadium win over fourth-bottom Yate Town. A crowd of 625 saw a goalless opening half and then Tommy Wright open the scoring eight minutes into the second half from the spot. 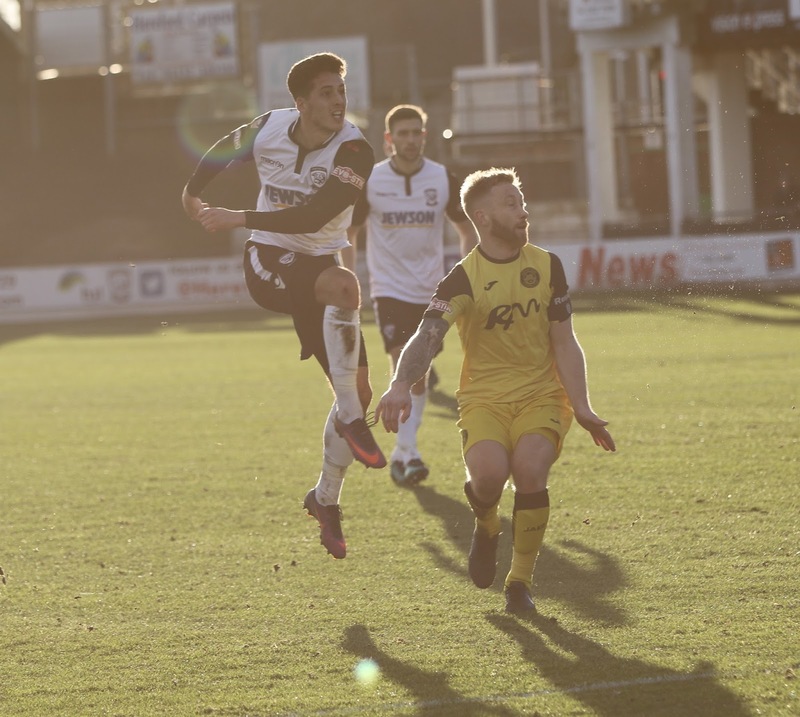 Tom Whelan added a second on 63 minutes and a brace from prolific marksman Justin Bennett on 71 and 79 minutes made it comfortable for the Whites. Mangotsfield United remain on Salisbury`s coat tails in sixth spot after a 2-1 Cossham Street win over Wimborne Town, thanks to a Lewis Powell brace after 28 and 58 minutes, with Carl Preston replying 11 minutes from time. The two bottom-markers, Bridgwater Town and Wantage Town, lost again and are both eleven points adrift of third-bottom AFC Totton, who won. Howard Neighbour`s 52nd minute penalty for Winchester City sealed Bridgwater`s fate at Fairfax Park, while Ben Brooks with a brace, Josh Egan and Joe Tumelty, were all on target for Larkhall Athletic at Alfredian Park against Wantage, for whom Sam Mason netted a consolation. Nat Sherbourne scored both of the Stags goals in their 2-0 win at Testwood Park against Shortwood United. Elsewhere, North Leigh won 3-1 at home against Slimbridge, thanks to Bradley Gray, Jamie Cook and Mike Hopkins – all after Lee Smith had given the visitors a first-minute lead. And the games between Bideford and Didcot Town and Bishops Cleeve and Barnstaple Town both ended all-square. Dan Western bagged a brace for Bideford at home to Diddy, whose Louis Joyce and Ricardo Andrady pulled the visitors back from two-down – the second coming five minutes into stoppage time. Town's James Mayne cancelled out Jacob Davidge`s 16th minute opener for Cleeve in the 73rd minute. Tiverton photographer Viv Curtis decided to stay with her fellow supporters under the Len Weston Stand to watch yesterday's game at Edgar Street. 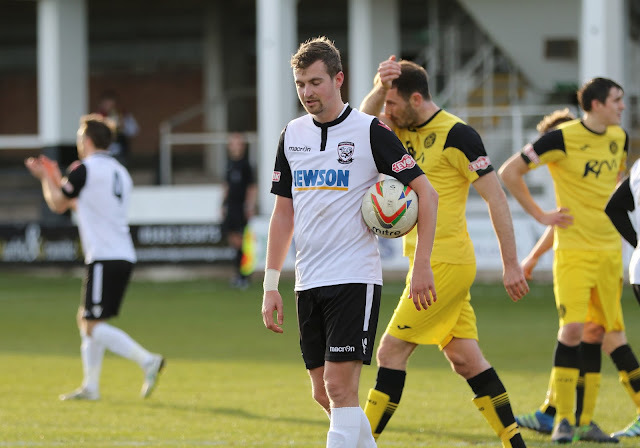 Hereford are back on the road next Saturday with a trip to Slimbridge FC. This match is all ticket and Slimbridge say that no tickets will be available on the day after 11am. Slimbridge AFC versus Hereford FC on Saturday February 4th 2017 is an All Ticket Match limited to 1200 tickets. Tickets can be purchased online via the link below. Slimbridge AFC would like to make it clear that everyone entering the ground will have their ticket pre-checked by professional stewards before entering the turnstile area and anyone found to be in possession of the wrong priced ticket will be asked to pay the difference or they will be refused entry to the ground. Parking inside the ground is for players and officials only. There is FREE Parking adjacent to the ground on a first come first served basis, as soon as you turn into Wisloe Road you will be directed by Stewards to these free parking spaces, please be considerate when parking your vehicle. Please DO NOT PARK in neighbouring driveways or block any entrances to private houses. Once inside the ground there will be ample refreshment areas set up especially for this game alongside our fully stocked clubhouse, there will be ample toilet facilities put in place, Gates will be open from 11.30 am, we hope that you enjoy your day with us. Tickets will be available online until Midnight on January 31st using the link below. Update: The Gazette reports that club will be selling tickets to personal callers between 2pm and 4pm on Friday and 9am-11am on the day of the game. No tickets will be available for sale after that time. 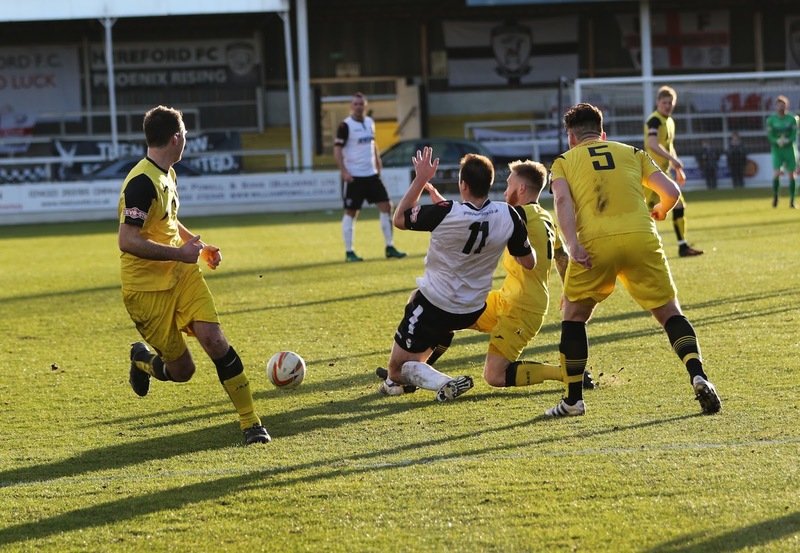 Hereford manager Pete Beadle made no changes to the side that beat Yate Town 2-0 last weekend, as Tiverton Town travelled to Edgar Street yesterday (Saturday). After a minute’s silence to commemorate the life of the late club chaplain Shaun Skinner, the Bulls got the game underway attacking the Meadow End in the first half. Pablo Haysham had an early chance on goal, but his powerful shot from outside the area was blocked by Jamie Price. With three minutes on the clock, John Mills forced visiting keeper Joe Parry into making his first save of the game. After beating the last man, Mills’ initial shot was parried by the keeper, but the former Didcot man managed to pull the ball back to try his luck from an acute angle, but the recovering defence cleared the ball off the line. Another long-range effort from Haysham four minutes later was inches wide of the target, with the hosts firmly in control of the game. In the 12th minute, after cutting into the box from the left-wing, Pablo Haysham was brought down by the backtracking Ben Mammola, with the referee immediately pointing the spot. 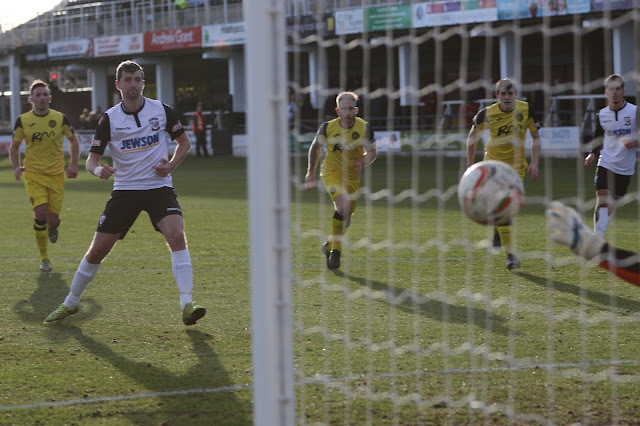 Hereford’s top scorer, John Mills, stepped up to take the penalty, making no mistake as he buried the ball in the back of the net despite the keeper diving the right way. With 26 minutes gone of the first half, the referee awarded Hereford a free kick after Tristan Plummer was fouled on the right. Mike McGrath's delivery to the far post was headed behind by Steve Kingdon, with John Mills unlucky not to increase Hereford’s lead as he tried to turn the ball home from the corner. 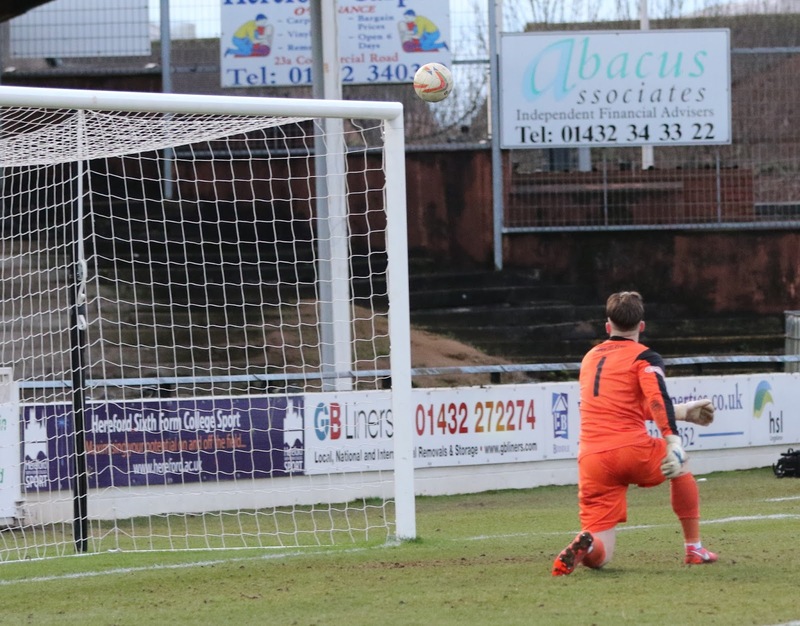 With Tiverton trying to clear the ball from a jumbled defence, Pablo Haysham latched onto the end of a loose ball and sent an unstoppable lofted shot past keeper Parry to double the lead. A determined run down the right from Tristan Plummer moments later ended in his deflected effort sailing straight into the arms of the keeper, before Tivvy capitalised on a dip in Hereford’s tempo following an altercation between the two benches. Six minutes from the break the hosts pulled a goal back with Tom Gardner firing the ball into the roof of the net from a set-piece. The second half started slowly, with Hereford's first chance a snapshot from centre-back Ryan Green, but Tiverton’s stopper was untroubled as the ball curled wide of the goal. Nine minutes after the restart, a strong penalty shout for Hereford was turned down by the referee. After Gogglebox Star Tristan Plummer was seemingly brought down by a Tiverton defender, the referee signalled for a goalkick after the ball went behind. With the hosts awarded a free kick in a dangerous position, Levi Landricombe should’ve done better as his effort sailed high and wide of the mark into a vocal Meadow End. Eight minutes later Alex Harris did well to deny Tiverton the equaliser. Rob Purdie left the ball to go behind, but Tiverton managed to whip in a cross to Tom Bath whose shot was saved by Harris. 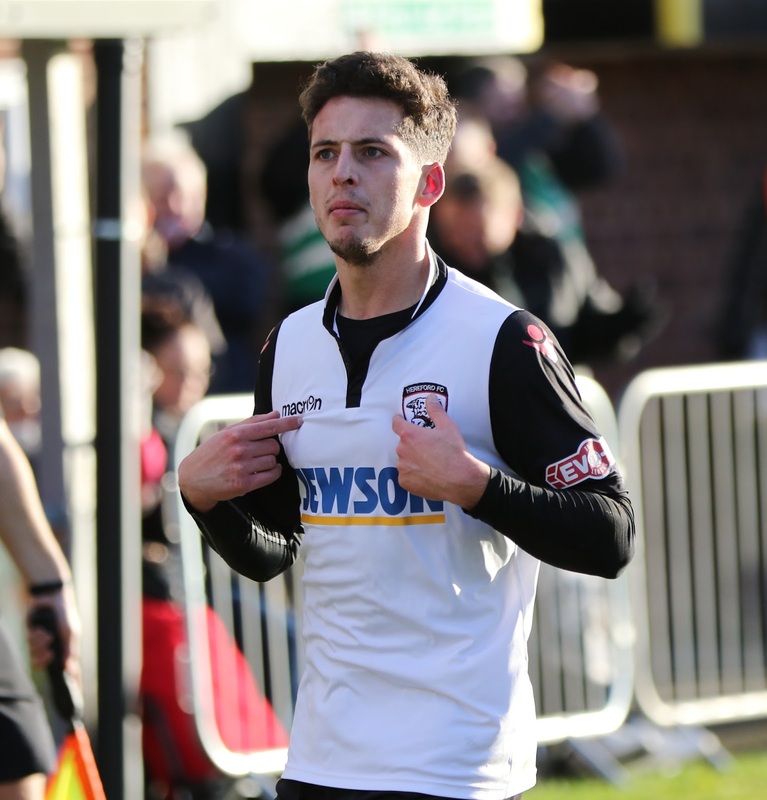 Hereford then had a number of chances to regain their two-goal lead, with a rare shot from midfielder Mike McGrath whistling wide of the upright, before Tristan Plummer saw his shot from an acute angle punched clear by the goalkeeper. With eight minutes left on the clock, John Mills evaded numerous challenges from the yellow shirts of Tiverton as he worked his way into the box, but his rising right-footed effort hit the crossbar. In the 89th minute John Mills managed to pull the ball back for Rob Purdie in the centre, but his weak effort was straight at the keeper. Deep into stoppage time Mike Symons had the ball in the back of the net, slotting home Mike McGrath’s neat pass, but he was adjudged to have been offside and the goal ruled out. Hereford: A. Harris, Oates, Edwards (c), Purdie, Green, Preece, Plummer (Molyneux – 87’), McGrath, Mills, Haysham, Symons. Subs not used: Sinclair, Fortune, Williams, Horsell. Tiverton Town: Perry, Hurst, Price, Gardner, Kingdon, Mammola, Norrish, Short, L. Landricombe, Bath, M. Landricombe. Subs: G. Rogers, S. Rogers, Walton, Rosenquest and Carter. Next Game: Slimbridge Away on Saturday 4th February at 3pm. Tickets here (link).